If you’re looking for gorgeous Valentine’s Day treats, check out the below 10 creative cookies. These Valentine’s Day cookies look SO good. Way too good to eat! Looking for a yummy chocolate mousse with Greek Yogurt? Then you are at the right place! I have scrolled the web for the best chocolate mousse recipes made with the healthy and tasty Greek yogurt. Enjoy! What a colorful pizza recipe to express your cooking creativity in an easy and healthy way! Found on gimmesomeoven. I love it! Looking for a yummy, unique way to say “Happy Valentine’s Day“? I’ve rounded up some of the best Valentine recipes. Hope you enjoy! 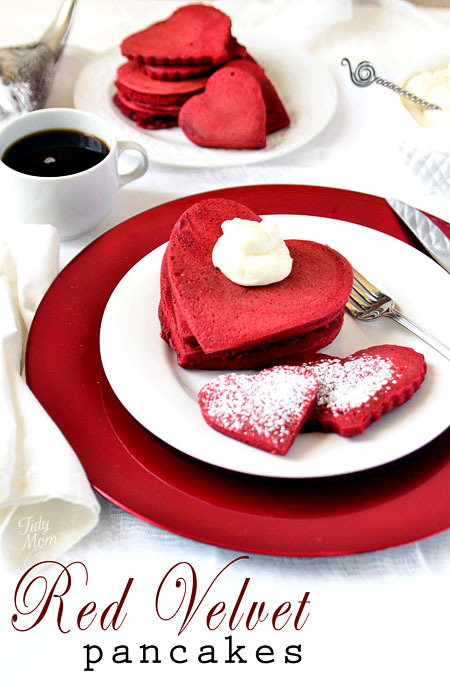 These heart shaped red velvet pancakes are really delicious and perfect for the Valentine’s day! Love struck cupcakes…a simple and creative idea for the valentine’s day. The cupcakes are pierced with cute Cupid’s arrow made of lollipop sticks and paper decoration, and garnished with heart shaped sprinkles. Just saw this dessert from ericasweettooth. Erica has made something so simple look so amazing, I want one now! Healthy pizzas…mmm…is that possible? Yesssss!!!!!!! Pizza CAN BE healthy! It’s fun and easy to make healthy, delicious homemade pizza so just grab your favorite toppings and head for your grill! Even though it’s late summer already, the temperatures are still high and there’s nothing like a frozen yogurt or popsicle melting down your chin. I’ve scoured the web for 15 delicious, super healthy and super easy to make treats. Enjoy!